Photographer Flora Borsi imagines what the models of abstract paintings must have looked like if they were distorted in real life. I wish she'd do one of my girls! The difference between price and value. I really enjoyed watching Molly Crabapple talk art on Last Call with Carson Daly. 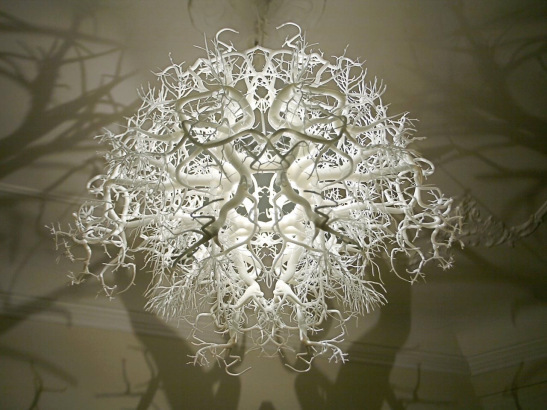 It would be an absolute dream to have one of these light sculpture chandeliers in my living space. An interview with the winner of "Work of Art", 1.5 Years Later. I love Kymia's candid honesty. How to grow a nanogarden. I wish I could be in NYC this Summer for the Rain Room exhibition at the MOMA. The art of being a goal-getter is a great read.